A recent bit of news from Scottish and Southern Energy (SSE) suggests that James Lovelock, the scientist behind the Gaia theory of Earth and its life systems, might have a point when he criticises most renewable energy sources as inefficient at best and foolish at worst. In its latest interim management statement, issued this week, SSE reported that “weather conditions” during April, May and June contributed to a full 30 per cent drop in electricity output from its wind farms, hydroelectric facilities and Slough biomass heat and power plant. Output from those sources fell to 700 gigawatt-hours during that period, compared to the 1,000 gigawatt-hours generated during the last quarter of 2009. While SSE didn’t elaborate on those “weather conditions,” one factor certainly had to be the fact that the first half of 2010 saw the “driest first six months of the year for 100 years,” according to the UK’s Met Office. And, as the climate continues changing, Britain can expect that type of situation to become more common, the agency warns. “Used sensibly, in locations where the fickle nature of wind is no drawback, it is a valuable local resource, but Europe’s massive use of wind as a supplement to baseload electricity will probably be remembered as one of the great follies of the twenty-first century … ,” he writes. Lovelock argues the only clean energy sources that make sense for society are nuclear and solar thermal energy. All the rest aren’t viable without heavy injections of government subsidies and green cheerleading, he says. Lovelock acknowledges he sometimes takes a bit of hyperbolic licence to make his points — as when he warned that global warming will lead to a die-off of billions of humans this century, resulting in only a “few breeding pairs of people” left in the Arctic. But does he have a point here? Is the bit of news from SSE a warning sign that we’d be better off by aggressively developing nuclear and concentrating solar power (such as that proposed in the Desertec project), and forgetting more intermittent clean-energy sources? ‘Our climate changing’? I know that over thousands of years climate changes through natural causes but at the moment we in the UK have the same old climate- a west coast temperate climate which guarantee that the weather patterns will provide extremes of hot, cold, wet and dry. 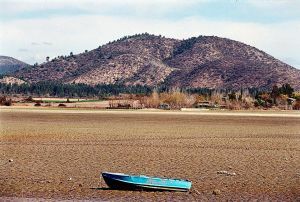 A dry weather pattern may prove cooling due to there being less water evaporated from the oceans giving less rainfall. This will be one part of the overall natural cycles that climates have. Very often, on Norwegian TV, when an important matter are to be discussed, they drag forwards some old communist and ask him for an opinion. Most likely he supported Pol Pot in his atrocities. Now, why dont you ask some old National Socialist to solve the Peace problem in the middle East? It is so typical by the leftist media. Again and again, they think its important what such old commies think. I dont. So what caused it 100 years ago? There really is nothing unique in our current weather and computer games are not predictors of the future. We are destroying the natural environment with these monstrosities and no amount of reasoning makes any difference to the zealots. Rare for me to agree with Lovelock, father of the “Gaia” theory. But in this case, he’s exactly right. EU’s attempts to use wind energy for base load power supply will go down in history as the worst kind of energy/economic folly. For you green campaigners following this stuff, you should be prepared for the coming track wreck, in which green political ideology crashes headlong into science, economics and the laws of physics, none of which, like Mother Nature, deal kindly with ideology divorced from the basic principles of each. Those of you invested in the EU Climate Exchange, take note. Your credits are worth zero, you just don’t know it yet. When (not if) Kyoto is not renewed/replaced in 2012 – and it won’t be as the US and China and India won’t play ball – the EU green rats will flee the ETS shinking ship and the credit market will collapse. The only fun game left to play in this regard is guessing the date.